This jacket is based on Schott’s Classic Racer #141 but it’s red, white & blue leather stripes were inspired by the jacket worn by Peter Fonda in the classic 1969 counterculture movie Easy Rider; a classic jacket with a touch of patriotic flair. Made in the USA. This jacket is based on the Schott® Classic Racer #141 but is accented with red, white & blue leather stripes on the left sleeve and right chest. Inspired by the one worn by Peter Fonda in the classic 1969 counterculture movie Easy Rider (although Fonda’s jacket also featured a large American flag on the back, which this jacket does not have). The Easy Rider Cafe Racer has the clean, simple lines favored by many bikers who prefer a more conservative style of jacket with patriotic flair. 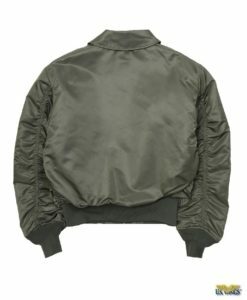 Although it’s a true motorcycle jacket through and through, its sporty appearance also makes this jacket very appealing to non-bikers as well. Made in the USA.